This is our 100th blog post : ) Check out what we were saying on day one (The Love of Lumos). A new era of business is coming, one that is driven by collaboration, crowdfunding and the desire to kickstart the creative economy. Two weeks ago, we wrote a post about the Building Blocks for the New-Era Business, so today we are going to take a look at the first component in the PLAN process, the business model. The business model is one of the key elements in the planning process. Without a rock-solid business model, no business (or social enterprise) can sustain itself over the long term. When you break down the PLAN into its basic components, the business model is the what and the strategy is the how. Business models have multiple components that combine to shape what the business will look like in the market – we will discuss these individual components further into the blog. Why is it so important to PLAN your business model? Business model innovation is the essential activity for any company that wants to succeed in the new era of business. With change occurring at such a rapid rate in markets globally, consumers around the world are beginning to rapidly redefine the value curve. Spending five hours trying to reinvent your value proposition today using the business model canvas could save you from five years of frustration by going down the wrong road. The goal is to develop a business model that can withstand and adapt to the rapid changes that are happening in the market, as the rate of change will only accelerate more going forward. Once you understand what a business model is, you need to have the tools to experiment with your own business model. We are big fans (!) of the Business Model Generation concept and the corresponding business model canvas – we have written extensively about these tools (see post The Key Components of a Business Model) since the first book came out in 2010. Of all the tools in the market to help plan a business, the canvas has proven to be the most valuable. Additionally, there is a very strong global community (check out the Business Model HUB), so the concepts are constantly being updated and knowledge is being shared. (click here) to see a larger version of the image or (click here) to download the canvas as a PDF. 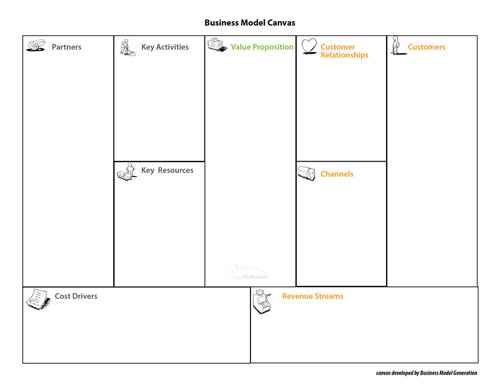 You can read more about each specific component here in our previous blog post (see post The Key Components of a Business Model), or you can download a preview of the Business Model Generation book (click here) that covers each component on the canvas. Essentially the canvas has two sides. The revenue side – which focuses on your customers and the ways you interact with them – and the costs side, which focuses on leveraging partnerships and key resources to keep costs low. At the heart of the canvas is the value proposition, which describes what the business does to justify its existence. While we recommend getting a giant piece of paper, some markers and Post-IT notes for your canvas, you can also just scribble notes on a basic canvas. If you would like a pretty PDF version, Powerpoint version, or Google Docs version of the canvas contact us. Once you start working on your canvas, keep in mind the goal is to open your mind and experiment. You want to explore new possibilities, consider absurd ideas and brainstorm quirky concepts. Business model planning is not about thinking outside the box, it’s about redefining what the box is. Be collaborative in your processes, solicit feedback and write outside the lines. pens or markers and Post-IT notes. Additionally, there is an app available on the iPad for the tech-savvy crew (link here). And that is how you can PLAN the business model. In terms of how you actually innovate the business model, that would require a whole other blog series. The key is to understand the core components and start experimenting to see what you can come up with. From there, you can start soliciting feedback and collaborating with the people who can help you make it happen. Keep in mind, that the business model is one of three components in the PLAN process. Additionally, we will be taking a look at the strategy you employ to make your business model work, and walk through a financial model template to evaluate the numbers behind the model. Stay tuned, as the Building Blocks for the New-Era Business roles out over the coming months.